How I Conquered One of My Biggest Fears and How You Can Too! Forcing yourself to move forward even when it’s easier to hang back. Taking baby steps to ease toward the scarier thing. Realizing everyone else has similar fears. Understanding courage only means taking action despite your fear. Watching little kids learn. Do they give up walking when they fall down? Do they give up climbing monkey bars when they fall off? Should you give up just because you’re worried it will be too hard? Back in college, I was the student who woke up with strep throat the morning of a class presentation. Not once, but repeatedly! How powerful is the mind/body connection that I would cause my throat to literally close up just to avoid looking like an idiot in front of my class. I knew I’d have to get over this fear or it would forever hold me back in my career. To force myself to get used to making public presentations, I got involved in the Student Council while I was pursuing a graduate degree. That meant I’d have to make a short class announcement every week (in other words, take baby steps). The second year I ran for a position and was elected Social Director— which meant I had to make an election speech and forever put myself out there as I organized all social events for the students, including the Graduation Formal (rather like planning a wedding but I didn’t get presents or a spouse out of it!). Once I was working for huge corporations like Nabisco Brands and American Express, I had to make presentations in corporate boardrooms. Later, working for advertising agencies and in my own marketing consulting business I had to make lots of sales presentations where my livelihood was tied to how well I performed. While my child was very young, I didn’t have to make presentations anymore and gradually my unease returned. When I launched my home staging company in 2002, I started small by answering decorating questions in mom’s groups, which I found “non-threatening” and a chance to practice! Then I joined networking groups and did mini-presentation about home staging. There were never more than about 50 people but still my palms were sweating and my heart was pounding. I must have sounded OK, because I always picked up at least one client whenever I spoke (that’s a tip for how you can grow your own staging business!). To this day, it never feels comfortable to go to big events that have a networking component. I hide in the bathroom powdering my nose and re-applying lipstick for about 5 minutes when I arrive, mustering up the energy to turn myself into an extrovert for the next few hours. Last May, I started to toy with the idea of getting up on larger stages after a very vivid dream about inspiring women to follow their own dreams. I’ve certainly been inspiring large groups of people for the past 7 years, but it’s been through blogging, teleseminars, courses and group coaching calls. Once I imagined speaking to hundreds of people from a stage, all my teenage fears returned. So I spent much of the past summer taking various courses and watching the masters— people who actually make a living from public speaking. I soaked up their tips, watched how they behaved on stage, etc. I wrote a pitch to speak at NLP Canada’s HOPE Symposium in September which was to a group of about 150. After that event, I entered the Stevie Awards for Women in Business, knowing that a win would mean a speech to a very large group from a Manhattan hotel stage! As it turns out there were 350 people, including the cast and crew from Real Housewives of New York(Ramona Singer won the Mogul of the Year Award and they were there to film her for their show). I got up and made a speech thanking the Staging Diva Team and the thousands of women (and a few men) who have trusted me to help guide them on their journey into home staging. I also congratulated all the business women in the room for having the courage to think big and go for their dreams. Despite my nervousness, it REALLY wasn’t such a big deal! It feels amazing not to be worried about this particular fear anymore! After my speech, the Director of PR and Social Media for Century 21 offered to feature Staging Diva on their blog with a regular column. This is the world’s largest residential real estate companywith 121,000 agents in 71 countries, and an opportunity that would never have come about had I not taken the steps to place myself where I could be “discovered” by new audiences. The Century 21 connection, which will lead to tons of exposure for Staging Diva and all members of the Staging Diva Directory of Home Stagers in the coming year, is not something I could have foreseen. But that’s just it, you just never know what opportunities might “fall in your lap” in advance! So take baby steps to overcome one of your own fears and discover the magic that awaits you too! How about declaring 2012 as the year you make decisions from a place of strength rather than fear? > Is Negative Self-Talk Killing Your Home Staging Business? 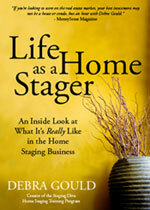 > Why Did You Become a Home Stager?